Before playing a note, Alejandro Escovedo apologized for letting five years elapse since their last show in Kansas City. That show featured Escovedo’s True Believers band mate Jon Dee Graham, a string quartet and ended with Mott the Hoople covers around two a.m.
Saturday’s sold-out show at the Record Bar was a little more restrained in contrast, but no less potent. The strings were gone, and Graham was replaced by other True Believer, drummer Hector Munoz. He was part of a lean, four-piece band that knew how to wring maximum emotion from Escovedo’s songs. The 90-minute show also ended at a more respectable time – just 30 minutes into the next day – with a Rolling Stones cover. 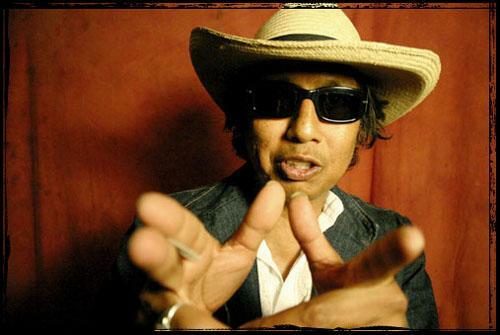 Escovedo’s songwriting holds more facets than a jewel, encompassing classical, country, Mexican, punk and classic rock. He displayed several of those sides, especially on the gorgeous instrumental “Fort Worth Blues” and the south of the border flavored “Rosalie.” Mostly, though, the quartet modulated between two modes – full-throttle rock and poignant acoustic ballads. Songs like “This Bed Is Getting Crowded” and “Tender Heart” were too mature to be straight-up punk, but they weren’t far off. It was invigorating to watch the 49-year-old songwriter rip into his material with such raw passion. After performing a new song, Escovedo closed the night sans guitar on a lengthy cover of “Beast of Burden.” With a trio of fans onstage providing backing vocals or percussion, Escovedo worked the crowd like, take your pick, an exuberant wedding singer or fevered rock and roll evangelist. By the end, everyone was converted. Setlist: Always a Friend; This Bed Is Getting Crowded; Anchor; Street Songs; Tender Heart; Fort Worth Blue; Sister Lost Soul; Down in the Bowery; Rosalie; Chelsea Hotel ’78; Castanets; Real as an Animal. Encore: Sensitive Boys; Lucky Day (new song); Beast of Burden (Rolling Stones cover).